It is a legal obligation to make it possible for subscribers to easily unsubscribe from your list permanently so no more emails will be delivered to them. 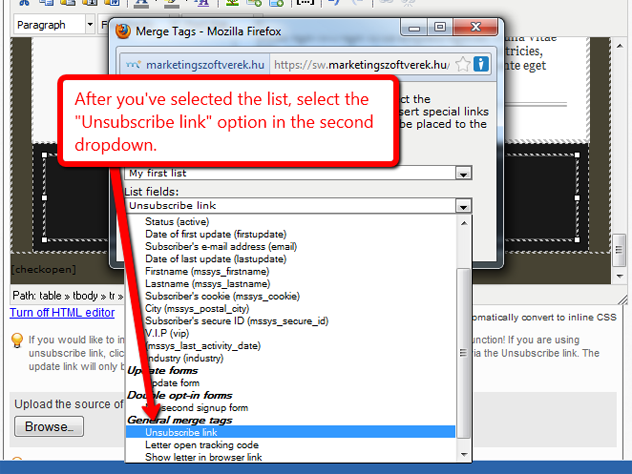 In SalesAutopilot it's very easy to place an unsubscribe option in an email. 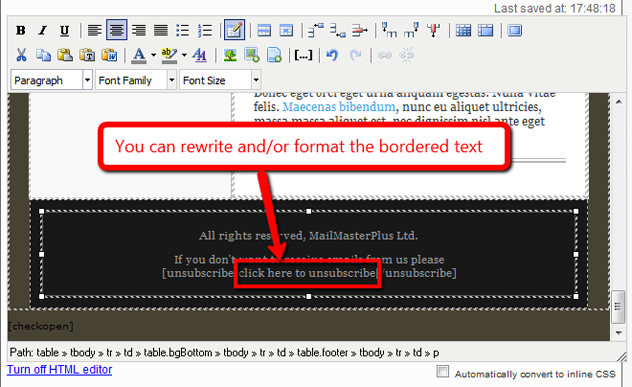 In HTML (Multipart) email the following code is needed: [unsubscribe]Click here to unsubscribe[/unsubscribe]. 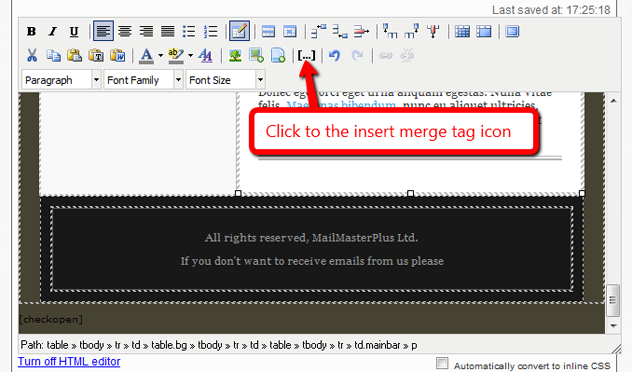 You can place this merge tag anywhere in the email content. When SalesAutopilot sends the email it replaces this merge tag for each subscriber with a unique link, the link text is: Click here to unsubscribe. When a subscriber clicks this link his/her status will be change to "unsubscribed" - so SalesAutopilot won't send any more emails to him/her - and an unsubscribe confirm message will appear that you can set to the list. This message can be completely personalized. 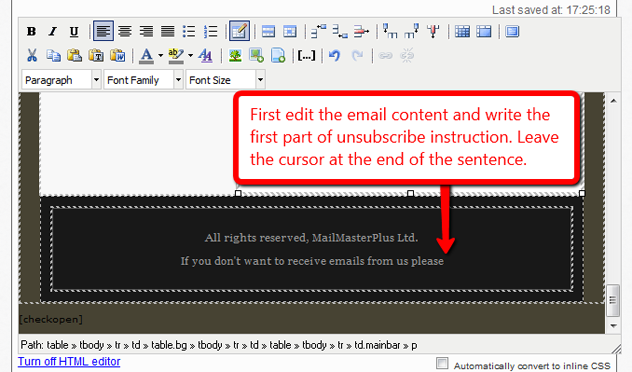 The following screenshots illustrate how to place an unsubscribe link into an HTML (Multipart) email. 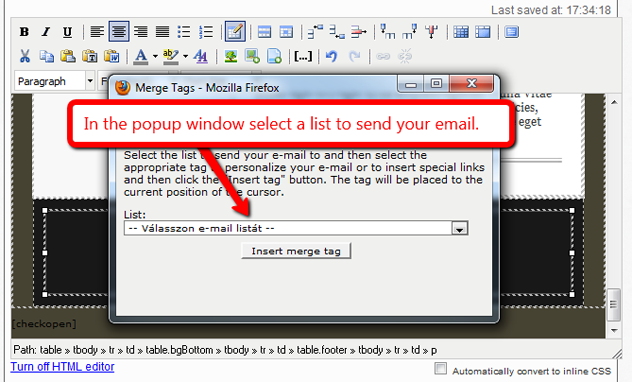 In a text email place the [/unsubscribe] merge field in to the content. It's recommended to place it at the end of the content into a new line. 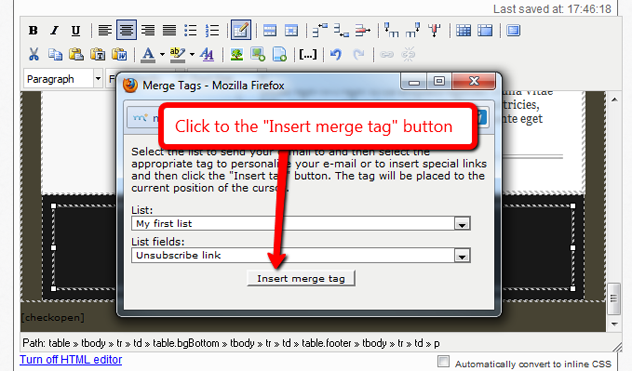 If you automatically create the text version from the HTML and in the HTML there is an unsubscribe link the converter will place the proper unsubscribe merge tag in the text version.